We are proud to offer Moving Services for your Campus, Facility or Business. From a small office move to a 10,000 employee migration, we have the operations team, experience and equipment required to provide a solution for your needs. Corporate Moving Systems is the exclusive Campus Mover for Redmond, WA based Microsoft. Our team provides single employee office moves, full team migration moves, single server moves, full server room migrations, and special project work. We also operate as the receiving warehouse for in & out bound shipments of everything from office desks to sofas. We don't just provide this wide array of services, we excel at it! Hello! My name is Rick Smith. I'd like to welcome you to the Corporate Moving Systems website and thank you for taking the time to learn about our great team and services. 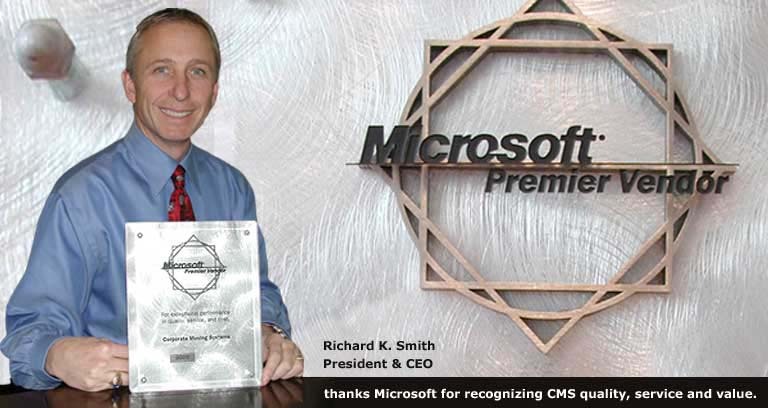 Recently, CMS was recognized by one of our Corporate customers, Microsoft, for providing really exceptional service. As the Founder of CMS, I take special pleasure in this award, and since you may be considering us as your vendor, I'd like to tell you a bit more about it. First of all, let me say that I'm accepting this award on behalf of all of the fantastic people that work here with me at CMS. Their commitment to you the customer, is unparalleled and I'm really fortunate to be able to work with such an extraordinary staff. The result of this commitment to quality is the reason why we received this award from Microsoft. As the world's largest and most successful software vendor, Microsoft understands the importance of team work. As a vendor to Microsoft, CMS is a proud part of that team. Over the past year, CMS has consistently delivered service that Microsoft ranks as exceptional in "quality, service, and cost." How exceptional? Well I'm proud to say that less than 1% of all Microsoft's vendors received this award. What an honor for us! What does this mean to you? I believe that it means that whether you are a business or an individual, if you select CMS as your moving and relocation services provider, you'll receive the very best, most competitively priced service that the industry has to offer. If you'd like to talk to me about this award or what we can do for you, please call me at (800)284-6683 or email me (rsmith at moovers.com). I look forward to hearing from you.